Some of the most stunning wedding photos can happen at night. After the sun goes down, every wedding venue is completely transformed and offers different opportunities to create wedding images that are dramatically different. 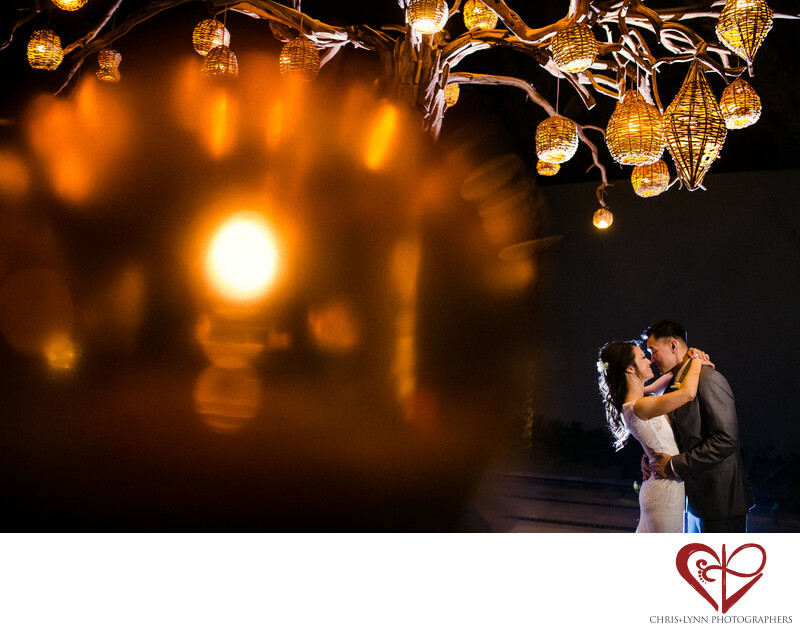 Night wedding images may be photojournalistic or more creative portraits. Many of our couples love to sneak off with us during the wedding reception after the speeches and main dances are completed to create a unique night wedding photo. It adds a lot of variety to their wedding coverage and is often the perfect end image for their wedding album. For this photo at one of our favorite Cabo wedding venues, The Resort at Pedregal, we photographed the bride and groom in the main entrance of the luxury hotel. We also photographed them in the chandelier-lit tunnel and at the candle-lit reflecting pool. This image was our favorite night photo of them due to the opposing color temperatures in it, the strong composition, and the way the lighting adds interest. Using an off-camera flash to backlight the couple, and the ambient light of both the hanging lamps and the standing lanterns, we created this portrait. I also love the look the bride is giving to her groom, and their connection together that shines through in this wedding photo. Location: The Resort at Pedregal, Camino del Mar 1, Pedregal, 23455 Cabo San Lucas, B.C.S., Mexico. 1/180; f/2.0; ISO 1000; 35.0 mm.